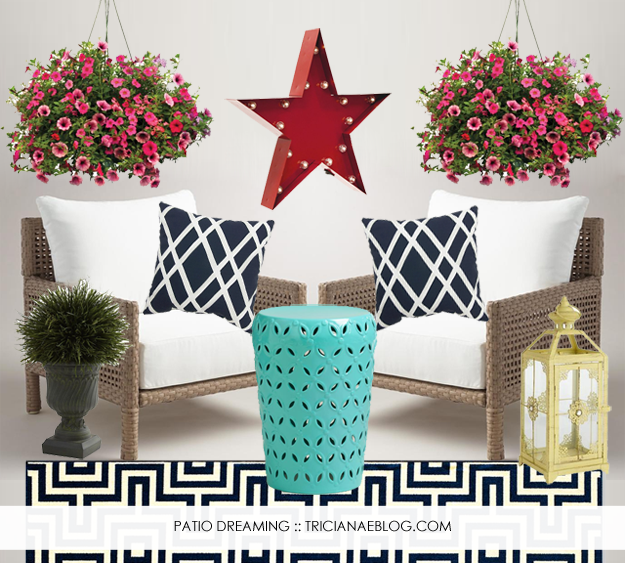 I've spent the last few hours browsing Pinterest (it's rained on and off here ALL weekend)....and I keep finding myself looking at cute patios/outdoor areas. Odd, considering I really prefer to spend most of my time inside. Also, we have a tiny patio and no other real outdoor area to speak of. Anyway, now I'm all motivated to decorate our patio. We have pretty basic furniture out there now. And a sad little planter with nothing in it. Not so festive. After playing for a bit, this is what I came up with. I am LOVING the chairs!!! They are in our price range too...and look so much more comfortable than the cheesy folding chairs we currently own. They are currently out of stock, but hopefully they will be back in soon. If not, I may play around with adding white cushions or something to our existing chairs. I'm hoping to start some sprucing up out there, before it gets too hot. In all honesty, I haven't done much as far as decorating is concerned anywhere in the apartment...I'd rather save money for decorating the house (that we hope to buy in a few months!). But, I was able to find some cute stuff for not too much. Even C said he loved this design board...so maybe he will help me with some DIY and bargain shopping! I'm Tricia. I'm a Texas girl, married to her Texas boy (aka "C"). I love Jesus, football, bookstores and all things design. I'm on a mission to (finally) lose weight and get in shape. I dream of being organized, debt free and pulled together. I usually get sidetracked by Pinterest or The Real Housewives of Wherever. This is my attempt to document all of that...mostly the latter. Occasionally, I use affiliate links in my blog posts. If you click and/or make a purchase through links on this site or any related social media platforms, I may make a commission from it. All opinions are my own.